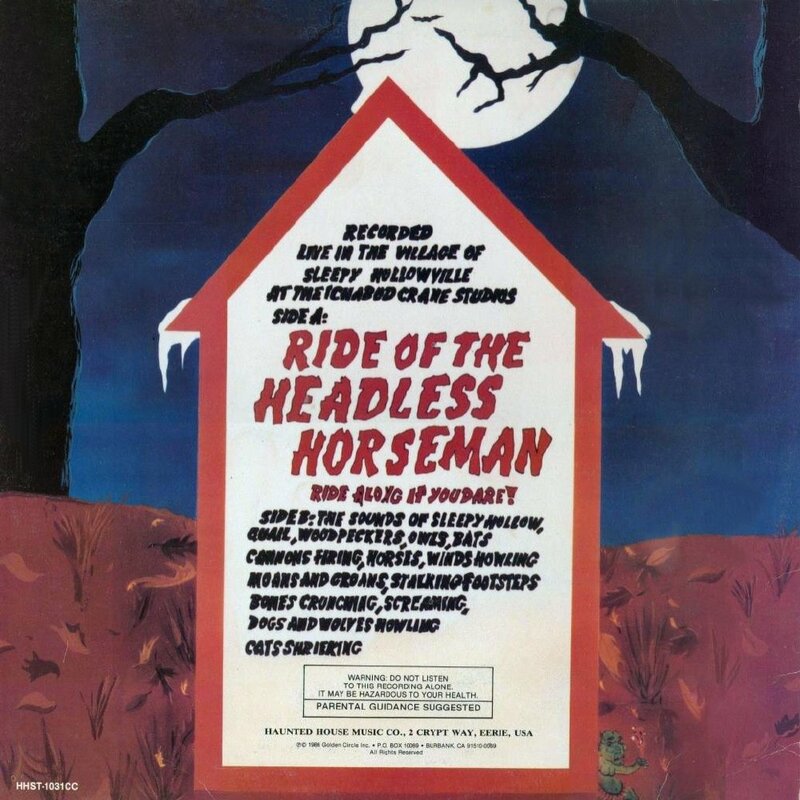 Tag Archives: Haunted House Music Co.
Today, instead of a written tale I’d like to introduce you to an oral tale set to vinyl by the Haunted House Music Co. in 1986, The Ride of the Headless Horseman. It has been a family Halloween tradition for as long as I can remember to play this record all Halloween night while passing out candy to cute little ghouls, ghosts, and goblins. 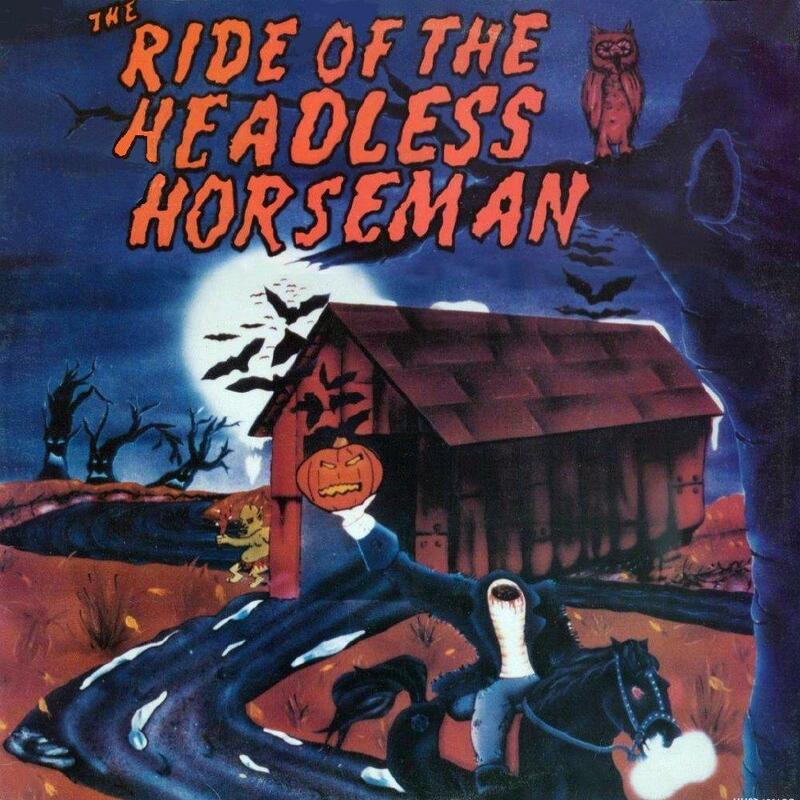 Once carried out by my grandma until she finally relinquished possession of her record collection passing the legacy onto me, still after 27 years, despite technological advancements in music, listening to The Ride of the Headless Horseman is a Halloween tradition that will never go out of style. The best thing about the record is it can be enjoyed by the whole family. Of course, I loved listening to this story as a kid, but even as an adult I play this record to set the mood of the holiday. While it used to be tradition to play this on Halloween night, I’ve expanded on that and now spin this bad boy while putting out my Halloween decorations. Side 1, clocking in at 12:14, is the spooky narration of an adaptation of Washington Irving’s short story The Legend of Sleepy Hollow set over atmospheric music and sound effects while side 2 offers 14:11 of a variety of isolated sound bites from the story, like the howling wind and screeching owls for example. I searched high and low, but unfortunately have no name for the gentleman narrating this story. His rhythm and tone coupled with the sound effects give the story a haunting feel necessary to get you into the Halloween spirit, so it’s a shame I can’t put a name with the voice. The anonymous narrator’s voice bears a slight resemblance to the beloved and iconic Boris Karloff. Missing Karloff’s notable lisp and with an English accent not quite as thick, our narrator nonetheless has the low tone purposefully paced that is familiar and comforting but evoking suspense in the listener as well. There is no CD that I have found of this particular recording, but if you have a turntable you can find used copies for just under 10 bones via Discogs or Amazon. If not, there is a full recording of side 1, which features the spoken word tale of the Headless Horseman, over at Adventure Amigos here. And just for the hell of it, here’s the Boris Karloff introduction to Black Sabbath. Let me know if you hear the similarities with our Ride narrator. So, that is just one of the many rituals I engage in to get me in the Halloween spirit. What’s yours?